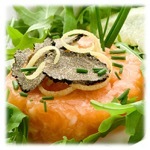 Why use dried truffle from us? Our dried truffle are thick and aromatic. They provide an affordable way to present truffles in your menus, with our the risk of fresh truffles spoilage and high price. When steamed or cooked well, our black truffles will expand and enrich any dish. It is practically astonishing how great they look on a plate.